The world is witnessing the highest level of human suffering resulting from conflict and disasters since World War II. The humanitarian “system” is not able to cope. The recent World Humanitarian Summit (WHS) was a once in a generation opportunity to change the way in which the world addresses humanitarian crises. The Feinstein International Center was on the stage at the summit to discuss changes that, if implemented, would enable the system to better protect and strengthen the lives, livelihoods, and dignity of people affected by or at risk of humanitarian crises. Helen Young brought her long experience working with local actors in Sudan to a panel that explored how a locally rooted humanitarian community can be more effective in responding to and mitigating the risks of crises. She discussed the two way process of building capacities, and highlighted the specialist knowledge and skills different actors bring. She emphasized the role of local and national networks that are embedded within government, civil society, and the international community. Such networks are uniquely placed to build more effective bridges and working relations between the local, national and even international levels. Inclusive networks facilitate exchange and learning that in turn promote more inclusive partnerships, local capacities, and more inter-disciplinary problem solving approaches that continue long after the international organizations have left. 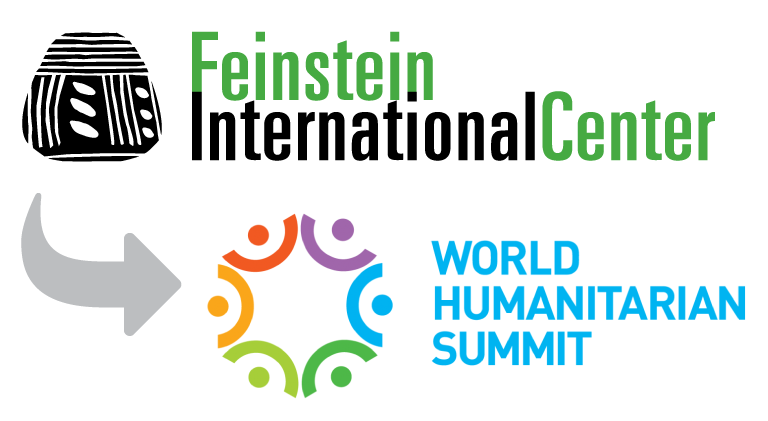 At the summit, Feinstein voices joined the 8,000 heads of state, international NGO and UN agency leaders, local civil society organizations, and academics to call for change and help show how it can happen. Daniel Maxwell and Antonio Donini helped to develop a panel on the future of humanitarian action, growing out of their work on the “Planning From the Future” program. Dan was also called upon to address the announcements plenary, a forum that ran parallel to the main plenary at the summit where key stakeholders announced their commitments to the “Agenda for Humanity.” He summarized the commitments of academia to the humanitarian sector and to the 125 million people in acute need in terms of improving the evidence base on which humanitarian decision making is based; building stronger partnerships with universities and research institutes in the countries affected by crisis to foster mutual learning; and training a new generation of humanitarian leaders. He notes that the research community should monitor the summit outcomes to ensure appropriate follow up. Inclusive networks...promote more inclusive partnerships, local capacities, and more inter-disciplinary problem solving approaches that continue long after the international organizations have left. At the summit, Feinstein voices joined the 8,000 heads of state, international NGO and UN agency leaders, local civil society organizations, and academics to call for change and help show how it can happen. In this role they were able to clearly raise the consequences that people face because of crises—not only in terms of nutrition or access to adequate food, but also in terms of lost livelihoods, displacement and forced migration, violations of human rights and humanitarian law, and other results of humanitarian emergencies. All involved hoped that this event would be a starting point for improving the humanitarian systems’ ability to respond effectively to crises. Outcomes remain to be seen, but Feinstein will continue to influence the evolution of the system through research and teaching. The team will continue to use its expertise and profile to challenge and work with the humanitarian system to develop into an effective “ecosystem” that is better able to meet the needs of people affected by disaster and conflict. The Feinstein International Center is a research and teaching center based at the Friedman School of Nutrition Science and Policy at Tufts University.